I was just a freshman, but a young professor, Vincent Kahee, with whom I had become friends at Dartmouth based on a common interest in the music of Ralph Vaughan Williams, invited me to audit his William Blake seminar. He was a Navajo from Canyon de Chelly, Arizona. Shortly before spring break he presented me with a handful of first-class railway tickets and said we should meet in Winslow, Arizona, exactly one week later. The Super Chief pulled into Winslow around midnight. I was met by Prof. Kahee, now wearing a bandana, cowboy boots, jeans, and a black shirt with a bolo tie. I exchanged the luxury of a roomette on Santa Fe’s legendary train for the front seat of a Ford pickup truck that had seen better days. The nearly full moon illuminated a mostly flat desert landscape, punctuated by arroyos, small outcroppings of stone, and occasional mesas. I slept for some pretty long stretches, but it seemed that each time I awakened, the roads were getting progressively worse, the last portion was a dirt road that must have gone on for over a hundred miles; I could barely distinguish it from the surrounding prairie. At the setting of the moon, but still more than an hour before dawn, we arrived at a small octagonal log structure which was a Navajo hogan. In front of the door, I was introduced to Vincent’s mother, kid brother, an even younger sister, and his aged uncle. I was then ushered to a pile of blankets along the wall and invited to sleep for as long as I wanted. Probably around eight or nine I woke up and was served a bowl of corn porridge in warm goat’s milk. The rest of the morning’s activities revolved around getting me prepared for a long journey by horse. “Have you ever ridden a horse before, Gert?” asked Vincent. “Never,” I replied. But five hours later, I was told that I was ready. Preparatory to the journey, which I was told would run from mid-afternoon until nightfall, that is, almost six hours, we sat down in the hogan for a generous meal of mutton, corn, flatbread, and fruit juice. I was seated facing Vincent’s aged uncle across the table. 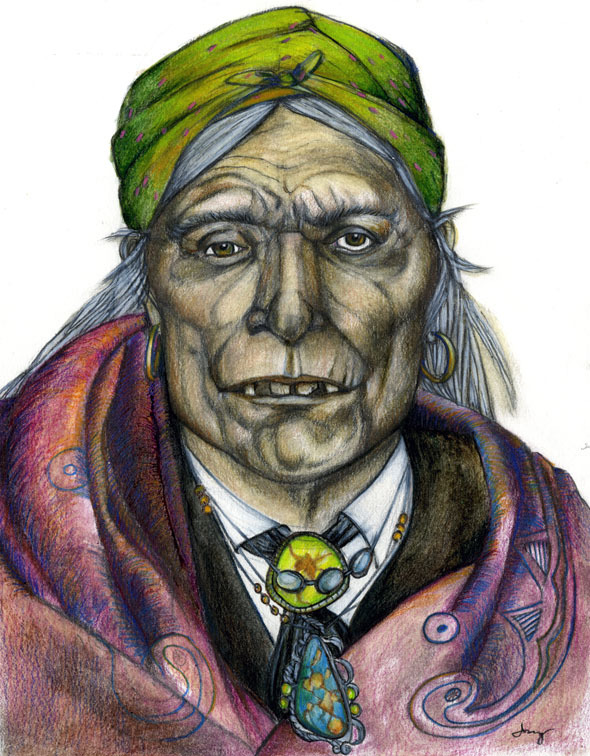 He was impressively ornamented in necklaces of silver, turquoise, and other stones and wrapped in a beautiful blanket. His face, however, was furrowed with wrinkles which looked like a system of dry desert creek beds. The eyes were heavy-lidded and somewhat weary, and his hair was a sheaf of grey straw held by a bandana. When his mouth opened, long natural teeth were revealed, but they had never benefitted from any kind of dental care. The process of aging had turned the old man into a kind of stately doll. So, this is what it was all about! I was to see a movie, someplace in the middle of this desolate landscape, five hour’s journey by horse from here! I visualized an almost ghost-town in which stood a lone out-of-business movie theater, in which a Blackhawk Films-type 8mm film would be projected on elementary-school-quality projection equipment. Vincent and I had ridden three hours before we came to the rims overlooking Canyon de Chelly. He pointed out the prominent landmarks: the great rising needle of the Spider Woman’s Lair; the opening in the distant cliffs of the White House; the side canyon in which the Indians made their last stand before being sent off on the “Trail of Tears” to exile in Bosque Redondo in southeastern New Mexico. And, finally, the approximate place of the grove where Kit Carson wantonly destroyed the ancient Peach Orchard. As we continued to the east of Canyon de Chelly, the full moon rose before us as the warm blue of the dusk started turning pink, then orange, then purple, then a pastel-tinctured grey, and finally starry night. We were riding down a steady and shallow downhill; in the distance loomed the shadow of a great cliff; in front of this cliff there seemed to be yellow stars on the ground, which resembled the lines of lights lining an airport runway. They were “lumenarias.” Lumenarias are small brown paper bags filled with lighted candles, supported and weighted down by sand. Approaching this row of lights, some Navajo appeared, greeted Vincent, and took charge of our horses. We were then escorted to a wooden ladder that descended into an earthen underground chamber. Beyond the entrance chamber, which I was informed was in the style of Pueblo Kiva, or a ritual council chamber, there was a much larger underground room which extended further eastward and sloped downwards to the bottom of the cliff which we had seen rising above ground. All was illuminated by candles placed at very small chimneys so that smoke would not collect. Along the spacious floor were dozens of rows of Navajo blankets. In the candlelight it was difficult to make out the natural color of the stone, but I was told that it was the bright red stone so characteristic of Arizona and western New Mexico. Situated almost in the center of this underground auditorium was a secondary one with a small ladder going up to its low roof, and another ladder descending into it from an opening in the top. With the slot opening in the front part of the wall, it resembled a Normandy pillbox. Vincent talked to a man standing near this structure and both of us were invited to climb up and then down into it. Inside was 35mm film projector, custom-built by Ernst Leitz of Wetzlar, Germany. It was powered by a Rolls-Royce generator located off to the side of the theater which was able to run in almost complete silence. I asked about the sound system. Vincent told me that someone from the firm of Klipsch in Arkansas had custom built a pair of Klipschhorn speakers which exploited the natural shape of the underground rock chamber to produce extraordinary amplification and fidelity at a low wattage. In brief, the projection system was unique, experimental, and state-of-the-art. The “screen” was not of any kind of cloth, but a polished face of the stone cliff which formed the front wall of this “theater.” Soon the audience had collected; Vincent and I sat cross-legged on a blanket about three rows to the front of the projection booth. To the steady beat of an Indian drum, the title and the credits of the movie are chanted. Only two or three names would be recognizable to a non-Navajo. Most of the Dineh are shepherds with their flocks, and they dwell in hogans. In Canyon de Chelly, other Dineh climb the cliffs on systems of ladders and even on the stone itself. Gradually, the camera isolates a single Navajo, Zhoab. He sits before his hogan, has a long white beard, and looks like a Hebrew in an Indian blanket. He is with his wife, his sons, and his daughters. In the great round curve of the opening of the cliff in which stand the ruins of Betatakin, a large bearded face appears projected onto the stone. It is Urizan, one of William Blake’s surrogates for Jehovah. A voice comes from the floor of the cliff dwelling. It is the voice of Satan and he is talking with God about Zhoab. The scene climaxes in a great orchestral swell in which God is surrounded by his host of Kachinas. God departs from Betatakin. William Blake, a young man with bright blond curls and a high forehead, triumphantly and mockingly dances about the cliff dwelling. Zhoab’s children are at the bottom of Canyon de Chelly dancing a stylized dance, a Navajo interpretation of a minuet. The daughters have fantastic corn-blossom hair arrangements. They are tending the sacred Peach Orchard. Then they commune with the Spider Woman atop her needle-mesa in the midst of the canyon. Suddenly they all fall dead. The fate of Zhoab’s family extends to the fate of the Dineh as a people; the story of the exemplary righteous man conflates that of Moadziss, leader and prophet of an oppressed people. Battles ensue throughout the various branches of Canyon de Chelly. It is a great dance of historical and present-day enemies, ancient Indians, the Spanish, other warlike tribes, white settlers, and even the dance of an iron horse. The Cavalry round up the Dineh, and they are forced on the “Trail of Tears” to exile in Bosque Redondo in southeastern New Mexico. Kit Carson, in cavalry uniform, comes to Zhoab and tries to persuade him that Bosque Redondo is where he should go. Zhoab spurns and curses Carson. Carson reveals himself as William Blake, and Blake reveals himself as Satan. The sacred Peach Orchard is burned. After several years the Dineh are allowed to return home to their native country. Zhoab is at the head of the procession, but it is carefully supervised by the U.S. Cavalry. Kit Carson is among them, but he is now clearly just an old soldier, though he and old Zhoab exchange knowing looks. Though he is now ancient and long bearded, Zhoab laboriously climbs to the opening in the cliff at Canyon de Chelly in which stand the walls of “The White House.” Disappearing behind these walls, he enters a dark chamber decorated with the reclining figures of Night from Michelangelo’s Medici tombs. Other sculptures from the unfinished Tomb of Pope Julius II surround Zhoab. It is a completely Blakean vision. Zhoab is again at the floor of the canyon and is transformed into Michelangelo’s Moses, complete with horns. He stands amidst his people, and there are Cavalry among them. Kit Carson gives a signal, and the Galliard of the Sons of Morning comes up as a brass band piece. Zhoab/Moadziss sees a vision of the Dineh in their future drunkenness and dissolution. There is even a dance which foretells the world of casinos. William Blake comes up and sits with Zhoab and his family. It is many years later. Zhoab appears as he did when we first saw him. He is surrounded by his children who are now themselves ancient, and all the men have long beards. The Navajo “Hohzi” or “Beauty Chant” is recited, and all the figures turn around and walk slowly into a canyon transfixed by dawn. At the end of the movie, only about fifty minutes in length, an old Navajo with a long staff stepped before the screen. He asked Vincent if Vernon Old Horse had come. Vincent relayed Vernon’s greetings and regrets. The old man bade everyone turn around in their blankets and sleep until dawn.